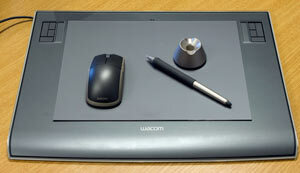 The IRC now has Wacom intuos3 tablets available for use. The tablets and pen can be checked out for one week. This website goes into detail about how to use the tablets: http://www.digitaldingus.com/reviews/wacom/intuos3/intuos36x8.php. The Wacom tablets are programmed with a variety of software applications, including Corel Painter and Photoshop. On the upper left and right corners of the tablet, there are shortcut keys that Wacom has already preset to 1) CTRL, 2) SHIFT, 3) ALT, and 4) SPACE. When using the control panel for the tablet (which is covered at this link: http://www.digitaldingus.com/reviews/wacom/intuos3/intuos36x8.php ), users can choose which keys will to be assigned to which function, and even which program uses them. Let your creativity shine – try out a Wacom tablet today! 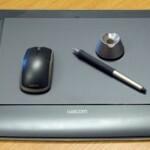 Please see an IRC staff member to check out the Wacom tablet and the accessories. The Group Study Room in the IRC has been transformed. In addition to being a study space, the room is now a place for presentations since a new projector and an interactive white board were installed this summer. An Epson 455Wi BrightLink Interactive Projector has been installed in the Group Study Room, and the LCD projector uses the same technology as the Wii gaming system to interact between the new SmartBoard screen, the projector and a computer. Presenters can now connect their computer via USB to the projector, which can project files from various software programs including Excel, Powerpoint, Word, Adobe PDF and keynote to display documents or photos. 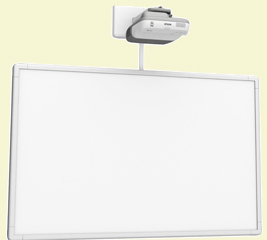 Interactive pens are also available for use on the SmartBoard, turning it into an interactive white board that can be used along with documents displayed by the projector. Presenters can use their phone or computer to project on the SmartBoard. The library wishes to thank IMS (IMSA Multimedia Services), HelpDesk, and Maintenance for supporting the library and insuring that this new technology was in place for the start of school. To reserve the Group Study Room, sign up on the sign on the door or see an IRC staff member. Please ask an IRC staff member for the remote control or whiteboard pens.